Home → Motorcycle Detailing → Dirty motorcycle? Why use Ultra Gloss Bike Wipes? Dirty motorcycle? Why use Ultra Gloss Bike Wipes? Washing a motorcycle by spraying liquid onto the road grime on a dirty motorcycle makes muck. When the wet muck is wiped up with a dry solid cloth, the cloth traps the grime against the surface. The grime might be gone but often a residue remains. 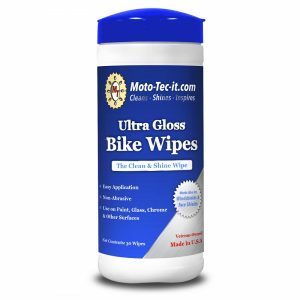 Ultra Gloss Bike Wipes are non-woven pre-saturated wipes. The “non-woven” wipe design captures the grime in the wipe. Removing the grime from the surface before a light buffing protects the surface. The cleaning agents in the wipes (Wipe-on) with the jewelers polish remaining after the grime is removed (Wipe-off) polishes the surface revealing the shine.